The world of crafts continues to expand even as people simplify their lives. More than ever, people are seeking meaningful, heart-felt pieces that add beauty and functionality to their homes, and the work from the eight artists in our 49th exhibit exemplified this aesthetic. 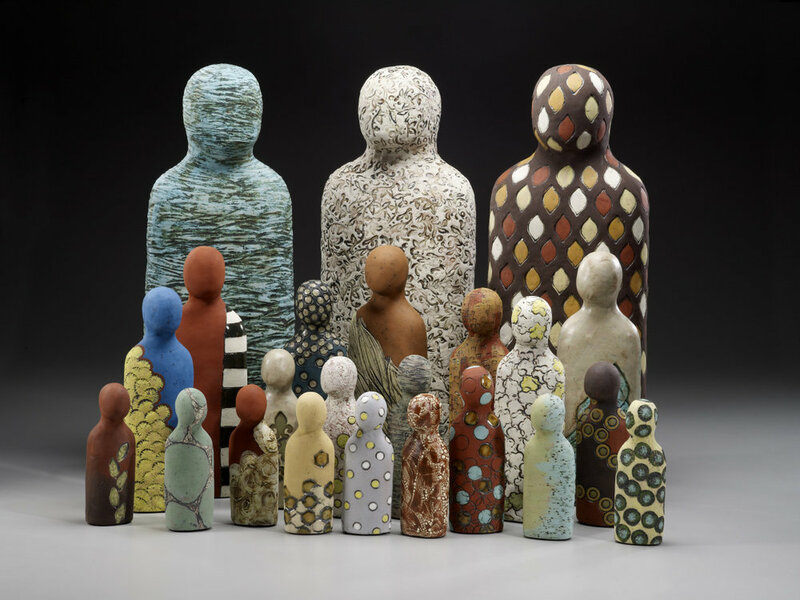 Cassie Ryalls Butcher (Asheville, NC) first exhibited her iconic ceramic "Souls" at the gallery in 2011. Since then, her simplified figures have grown in size and variety, while never losing their ability to resonate with something deep within. Maia Tsinamdzgvrishvili, an international award-winning fiber artists from the Republic of Georgia, sent over her newest silk "button" creations, incorporating new proprietary techniques that add another fascinating dimension to her work. 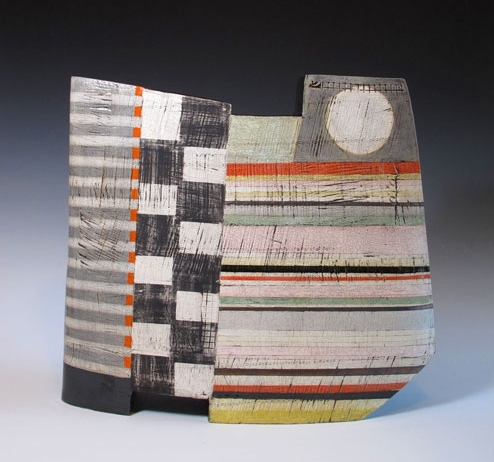 Sheryl Zacharia (Santa Fe, NM) creates geometric sculptural objects inspired by ancient relics and modern paintings. With a music and painting background, she strives to make visual poetry. 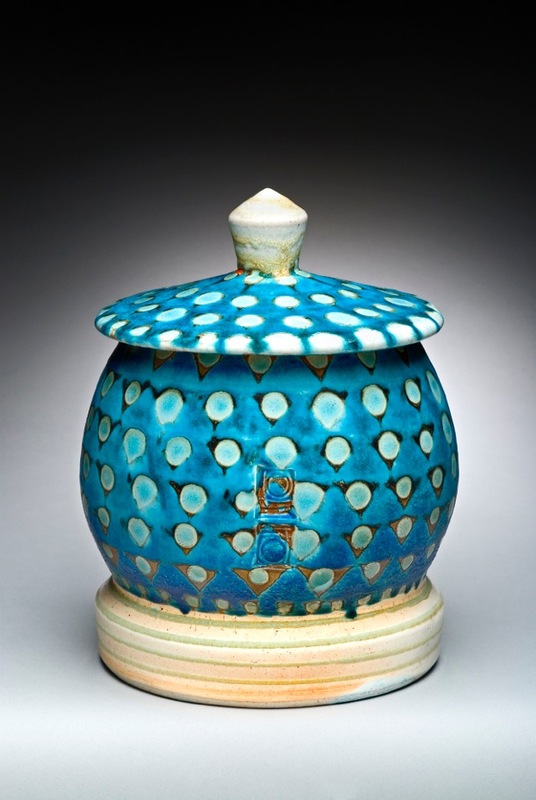 The soda-fired process, vibrant color, repetitive design and slight over-sizing of Mark Knott's (Atlanta, GA) vessels move his work from functional to sculptural. For this exhibit, Knott created a variety of 30 beautiful vessels. We see the influence of Vicki Grant's (Littleton, NC) 30-year architectural experience in her art. She builds her "Center to Earth" pieces around natural found objects with layers of porcelain, which she obsessively textures, then paints and mounts on slate. Melisa Cadell (Bakersville, NC) continues to surprise us with her clay sculptures of intense female figures, both beautiful and macabre. This exhibit featured new work from her Head series. Sondra Dorn (Ashville, NC) uses her imagination and mixed media to develop meditative series of intriguing landscapes. Dorn leaves traces of her drawings and stitching in these pieces, showing the "hand" of a multi-talented artist at work.